My son had difficulty sleeping , and when I felt I had exhausted all efforts (ie: chamomilla, rescue remedy sleep formula and transferral into my bed), I remembered my new placebo pilules and thought I’d give them a try…. I said to my 4 year old ‘I am going to give you a special tablet, and it is going to make you go to sleep’…He happily obliged ( not always the case), and almost instantaneously nodded off to slumberland, and thankfully so did I…… Thank you …I look forward to experimenting with them on many more occasions….many thanks. I was only thinking of you yesterday, stimulated by the bottle of placebo’s sitting on my desk. Yes, I take three a day and they are working !! Or at least something is. Maybe it was our talk. Haven’t fallen through a trapdoor since. Wow!!! Universal Placebo. Just what I always wanted. I have taken them all at once since I believe that more is more. I am now sane, balanced, brilliant, beautiful and 10kg lighter (in this last instance though, less is more) and the sun again shines out of my unowot. I would like to thank you for creating universal placebos. 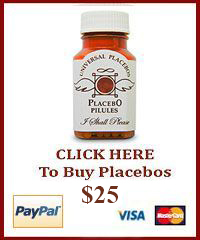 As your website states: Placebos are almost impossible to find. I have a daughter who responds well to placebos and I don’t like giving her real medication when she doesn’t need it. I once cured her cough with a little cool-aid in a medicine cup. Recently I was in a working party trying to design a new structure of governance for a not for profit organisation that had ten companies, employing over one thousand people with an annual budget of $90,000,000. We ground to a silent halt. No energy, no ideas. When you need help or when all else fails…. Placebo Pilules were passed around and these little treasures lifted the atmosphere and our energy and helped us to move towards creative solutions. Nothing Works Better!